The Associated Press reports that Michigan State University has launched an anti-AIDS program for Haiti and the Dominican Republic. 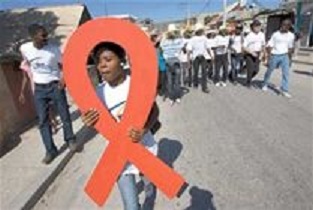 Health officials at Michigan State University say they’re hoping to improve AIDS prevention efforts on the Caribbean island of Hispaniola, home of Haiti and the Dominican Republic. The university says its Institute of International Health aims to reduce new infections on the island, which has about 75 percent of AIDS cases in the Caribbean. Institute director Reza Nassiri says local officials in the Dominican Republic and Haiti “have struggled to respond to the epidemic of HIV/AIDS based upon the resources available to them.” Nassiri says Michigan State’s approach involves providing training and mentoring for nurses, social workers and other local health professionals. He says his institute will present the plan at the Global Risk Forum’s One Health Summit 2012 in Davos, Switzerland, on February 19-22. The summit provides a forum for cross-disciplinary approaches to human health, highlighting the interconnectedness of human, animal and environmental health with food safety and security. Nassiri worked on the presentation with colleagues from MSU’s College of Osteopathic Medicine, Doctors United for Haiti in both American and Haiti, and the Boca Chica HIV Clinic and the Guanine Center in Santo Domingo, Dominican Republic.